We all know that Chinese companies love to clone everything from sneakers to smartphones, but that's not all. In the last few decades, architecture firms in China have started to copy iconic buildings and even whole cities from other countries. Here are some of the strangest copycat monuments, including the Eiffel Tower and the entire city of Venice. It's a gated community with an Eiffel Tower, some Parisian houses and the Champ de Mars. It was built in 2007 by a big real estate developer company. There is enough space to house at least 100,000 people, but its population is around 2000, which adds a ghost town-like feeling to this place. The wonderful, UNESCO-listed Upper Austrian village was copied by a Chinese mining company named China Minmetals Corporation. The project cost $940 million. The 15th century fishing village was demolished and the Chinese are building Manhattan with the Hudson river there. It will be completed in 2019. The Chinese copy was built in 1994, but demolished in the late 2000s, thanks to Fondation Le Corbusier. Mix the characteristics of the White House and the Capitol Building in Washington, and name it Shanghai Minhang People's Court. 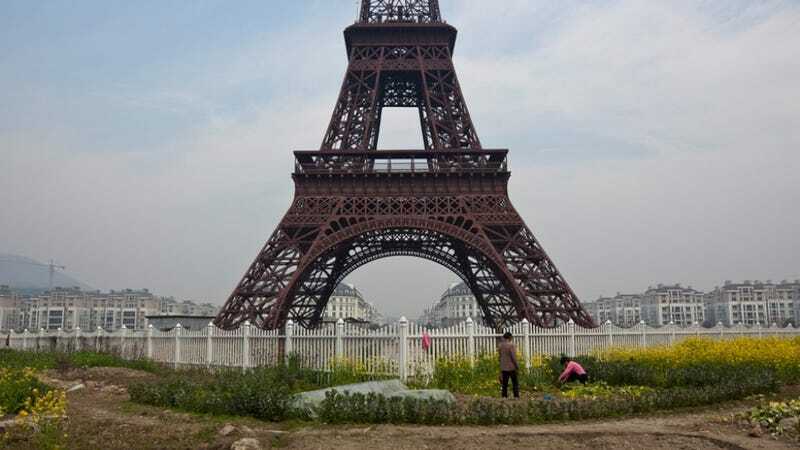 The theme park has more than 100 reproductions of the famous places around the world, including the 1:3 scale version of the Eiffel Tower, the Christ the Redeemer statue from Rio De Janeiro and the wonderful Taj Mahal. Thames Town is a gated community, just like Little Paris. Opened in 2006 with some Tudor-style houses, a fake Thames and an almost Gothic church. Because of the high prices, it's a ghost town too, but a really fantastic background for wedding photos. It was a corn field few years ago, but now this area has a grand canal, lots of Italian houses and a Colosseum-like shopping centre. The total project cost about $220 million, financed by a mining company. The richest city in China has a copy of the Great Wall, the Sydney Opera, the whole Tiananmen Square, the Arc de Triomphe and some of the world's best tourist destinations. The local inhabitants work 7 days a week, and they haven't got any time to travel, so they've spent almost 2 million dollars to copy them.